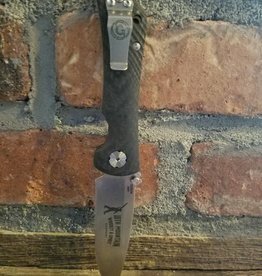 Thousands of man-hours go into the design and production of Southern Grind's line of folders, and it shows with their unmatched fit and finish. The Spider Monkey lives up to its tactical pedigree with the rugged dependability that leaves other EDCs far behind. They are built to last and they stand behind each one with a lifetime warranty. The Spider Monkey is the compact version of Southern Grind's flagship model, the Bad Monkey, and what an excellent little EDC blade this is. It gets a lot of design aspects correct like balance, grip, fit, finish, and definitely the materials. 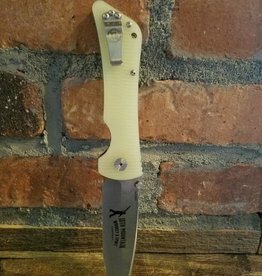 This Spider Monkey features a flat ground satin 3.25" drop point blade made from CPM-S35VN stainless steel. S35VN is one of the premier steels in the industry with excellent corrosion-resistant properties and more than adequate edge-holding capabilities. The handles are made from copper over full-length 6Al-4V titanium liners. Red Metals such as copper have strong natural antimicrobial, antibacterial and antifungal properties. Tarnishing is a naturally occurring process that happens when this material reacts with outside elements, such as oxygen, moisture or human touch. Because the handle scales are made of real copper, they will tarnish and patina. The pocket clip might be small but it is sturdy and provides strong retention while being easy to get in and out of the pocket. Another great design from Southern Grind, we look forward to seeing more variations of it in the future.